Jessie Smith is a writing intern with the Communications Team at the Utah Division of Wildlife Resources. She loves to fly fish and hunt in her free time. Jessie is excited at the opportunity to learn about wildlife management in the state. 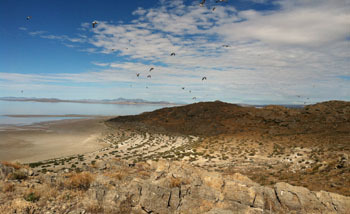 Not many people get to set foot on Gunnison Island, a patch of land sitting in the Great Salt Lake. Even fewer get to work with the birds there. So, when John Luft, Great Salt Lake Ecosystem Program (GLSEP) Manager, invited me to do just that, I jumped at the chance. I was thrilled that the Division would send a communications intern into the field! The island is the breeding ground for up to 20,000 adult American white pelicans — that’s a lot of birds! During our visit, we put bands on the birds’ legs and tags on their wings. This allows biologists to track their survival rates and migration patterns. 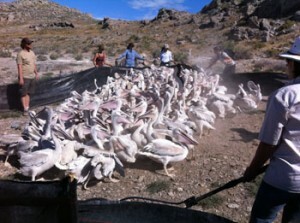 I can say with certainty that working with pelicans is just as exciting as it is smelly (and it’s very smelly). Looking down from the hill, I could see more birds than I’d ever seen in one place before. After a half-hour boat ride, we were at the island and got to work. John took one group over a hill to get to the banding site. Glancing over the ridge, I could see more than 300 pelicans below. We spread out and walked toward them slowly. Because we were on both sides, the pelicans formed a huddle. Once they were in a group, they were easy to herd into our makeshift fencing — a line of tarp. Now, all we had to do was pick up some pelicans and bring them to the biologists. It sounded simple, but picking up pelicans isn’t a very elegant thing to do. We used large nets to scoop each bird out of the group. An upside-down pelican in a net looks pretty comical, like something out of a cartoon. Along with a few other volunteers, I stood along the edges, stopping birds from escaping. The birds would move in a group around the enclosure, away from whoever was netting at the moment. I suggest trying to stay upwind of hundreds of birds in motion, kicking up sand and feathers. Whenever the group came close to an edge, it was easy to tell that a few were keen on jumping over the tarp. Some of them tried, and I soon figured out how to gently lift their beaks up and back into the fence after they started peeking over it. We were supposed to be spotting which were biggest so we could band those first. But, to be honest, with hundreds of pelicans, I was getting a little dizzy keeping track of any single one. I figured I’d stop focusing on individuals and try to spot patches with less baby fuzz and more adult feathers. That’s when I realized, all of these birds had fuzz! Once the pelicans were in our fence, we netted and the biologists banded them. Photo by Ryan Mosely. Somehow, I missed that we were working with one- to two-month old pelican chicks. After I realized that, so much more of the day made sense! No wonder these birds weren’t just flying out, over of our fence. No wonder their beaks and feet were so light-colored. But then, I thought, if these chicks stand as tall as my knee, how big are the adults? …and where were they? Jolene Rose, a Wildlife Biologist at Antelope Island, pointed over my shoulder. Behind me, on the hill, sat the biggest birds I’ve ever seen. Not all of the chicks’ parents were there (some were still out to feed) but enough were present to make me feel watched. Contrary to my worries, the adults only watched. One biologist offered me his net so I could catch and hold a pelican while it was banded. I didn’t trust myself with it, because it looked heavy and awkward. I couldn’t let the chance pass me by, though. So, when the mob of chicks came back to my edge of the fence, I just reached in and picked one up. That, of course, left its beak free to protest by pecking the top of my head. I got the little guy under my arm quickly and was able to hold a hand over his eyes, which calmed him down. At the banding station, I held the bird while one of the GLSEP biologists banded and tagged it. I let go, and it walked toward the beach, away from the commotion. Turns out, my pelican was mellow. Some of the others tried to jump the fence and get back to the group. Or, they’d plop down in the sand and inspect or bite at their wing tags. Eventually, the pelicans figured out that those of us watching the perimeter weren’t all that tough. They started snapping at us, and wouldn’t move away from the fence until we put our hands into the enclosure and shooed them away. The few left were getting quite the attitude! Finally, John called for one last pelican. After that, we were done. We packed up our things and hiked back to the boats before eating lunch. The first thing I did on the beach was empty my water bottle onto my hands and face. Everyone did me the kindness of ignoring the mud smears I’m sure were streaked down my neck at that point. Then, it was on to the boats. A nice cold soda and sandwich are decidedly the best way to end a day of working in the heat with hundreds of large, smelly birds. If you’ve seen a pelican with a wing tag — or you have questions about pelicans in Utah — please contact our avian biologist John Neill at 801-231-2019 or JohnNeill@utah.gov. What a cool opportunity! And a well written and entertaining article! It all sounds like smelly, messy – Fun! Great article Jessie…keep them coming. Nice article Jess! Reminds me of all those days catching and relocating geese at the many urgent reservoirs in Denver back in the day. Lots of fun! Kind of funny how awkward pelicans appear on land and yet so graceful in flight.